My maternal grandfather made legendary yeast rolls. Legendary. His rolls are the cause of my love of real butter. He passed away 20 years ago and even though I was just a little girl when he went to glory, I remember those rolls. Many family members have tried (and come close), but nothing could match his rolls. I've always been intimidated by any recipe that uses yeast. If the water's too hot, the yeast dies. If the air is too cool, the bread doesn't rise. Then there's the kneading and judgment of how much flour to add. Well, technology has made this whole process much easier. My Kitchen Aid has a dough hook that kneads this batch of rolls in under 5 minutes. My oven has a proofing setting and a convection bake option that helps me create perfectly golden and fluffy rolls. I feel much more confident with my new school kitchen tools. So, these aren't pop pop's rolls. These are Kee's rolls. He made his old school, by hand. I make mine new school, with a Kitchen Aid mixer equipped with a dough hook. Special shout out to Monica at Lick the Bowl Good for putting me on to this recipe. I made these rolls this past Sunday and brought some to my mom. I know my mom was proud. My hubby was proud, too. He told me they looked like they came from a store, but they taste homemade. I take that as a compliment. I believe these rolls will be making a surprise appearance for Thanksgiving at my in-law's home next week. 2 t. salt I used 3 t.
In a small saucepan, heat milk, butter, sugar and salt over medium heat until butter is melted and sugar is dissolved. Remove from heat and let cool to lukewarm temperature (leave at room temp for 30 minutes, or place in the fridge for a few mins). Warm your Kitchen Aid mixer bowl by rinsing it with hot water. Add the warm water and yeast to the bowl. Mix in the lukewarm milk mixture and stir until dissolved. Attach the dough hook to the mixer. Add 4 1/2 c. flour to the liquid mixture and turn mixer on low. Add flour, 1/2 c. at a time until dough pulls away from sides of bowl and starts to "climb" the hook. (This took 5 1/2 c. flour for me.) The dough will be sticky, but it should form a ball around the hook. Knead the dough for at least 2 minutes. 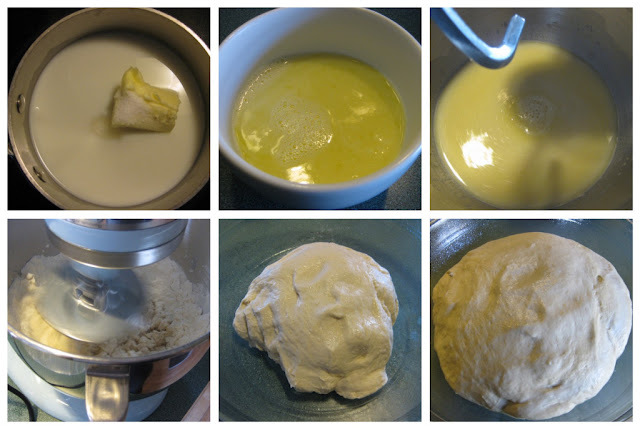 Once dough has risen, turn it out onto a floured surface. Cut the dough into 24 equal pieces. Place the dough balls into a 9x13 baking pan (sprayed with nonstick spray and lined with parchment paper). You'll only be able to fit 16 rolls in the pan, so you can put the rest of the rolls into a smaller pan (I used an 8x8). Preheat oven to 425 degrees. While the oven is heating, cover the rolls with a towel and let them rise a second time (they will double in size). Bake the rolls for 12-15 minutes, or until golden brown. Immediately remove the rolls from the pan and place on a cooling rack. 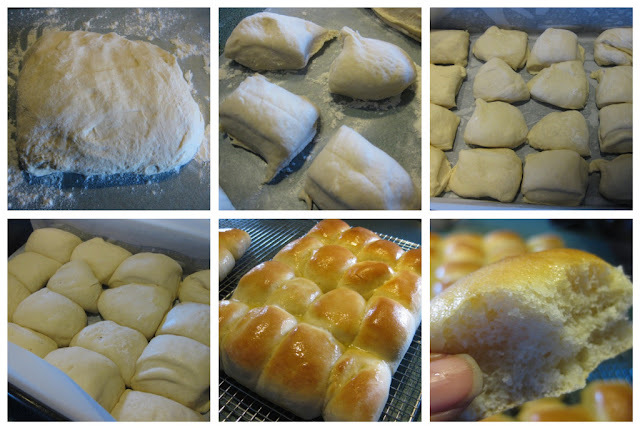 Brush tops of rolls with melted butter. Or, be like me and split them open and slather them with butter. Do I need to tell you how good these rolls tasted or how good my house smelled? If you have a Kitchen Aid, you need to make these rolls! Yes. Yes, I agree! I NEED those rolls. They look amazing! Kudos for conquering your fear! I'm pretty certain your PopPop would be proud too! Wow, you made me hungry again. I will definately not miss another event at your home! I saw these rolls on your header and thought - "ooh those look so good!" and they do! You did a wonderful job and I'm so glad I could help you out with this recipe. It really is simple and it smells so darn good in the oven. I bet your mom and in-laws were proud of you and these rolls. Congrats on your success! I made these rolls again for Thanksgiving (4 batches) and they were a huge hit. Mom, mom-in-law, grandma, great-grandma... they all loved them. Thanks again to Monica for blogging about this recipe!